No, this isn't a post about jokes bashing lawyers and for that I offer my apologies. 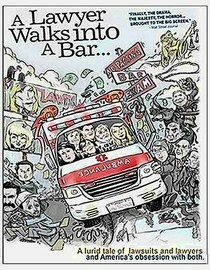 A Lawyer Walks into a Bar... (click here to add to your queue) is a documentary about six people from various backgrounds who have graduated law school and are waiting to take the bar exam in California. Apparently California has the toughest bar exam in the nation and it did seem to put a ridiculous amount of stress on all the people taking it. For me the documentary was pretty interesting because way back when I almost went to law school before deciding I'm too capable of evil to take that path. I thought it was pretty entertaining but keep in mind that this is very much from the point of view of lawyers so it's not a completely accurate look at the legal system but only lawyers. If it sounds like something that might interest you give it a look. Why is it in your queue? I find law fascinating. Best thing about the movie? Waiting for the results to come in. What mood should I be in to watch this movie? In the mood to see some people more stressed out than you are.